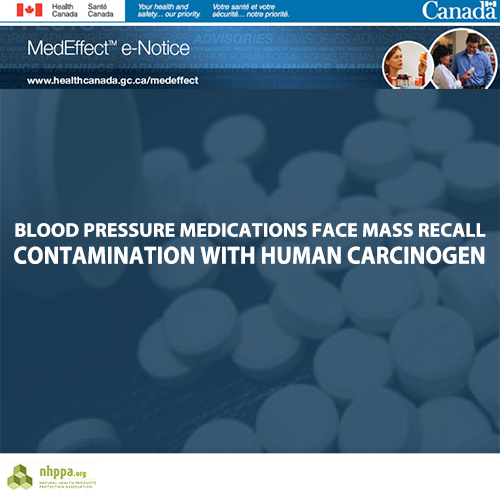 On July 10, 2018 Health Canada released a MedEffect Notice advising of a recall of certain medications containing Valsartan. Valsartan is an ingredient found in a class of medications known as Angiotensin II Receptor Antagonists and is used to treat high blood pressure, congestive heart failure and to increase the chances of living longer after a heart attack. Side effects of using Valsartan include chest pain, dizziness, vomiting, blurred vision, palpitations, joint pain and more. A number of products containing Valsartan have been found to be contaminated with a known human carcinogen called N-nitrosodimethylamine (“NDMA”). NDMA is toxic to the liver and other organs and is also used to create cancer in rats used for cancer research. The Valsartan in question was sourced from Zhejiang Huahai Pharmaceuticals in China. Patients currently taking the medications affected by this recall have been instructed by Health Canada to speak with their prescribing doctor or pharmacist. They will likely be advised to take another chemical drug to treat their condition by their primary care practitioner. And they will likely *not* be informed as to the full spectrum of safe and effective natural treatment options that we know are of significant benefit. Health Canada’s proposed regulatory changes will move us into an environment designed to ensure that natural treatments are not used for serious health conditions. Indeed, the intention is to further restrict claims that can be made about the uses and benefits of natural health products. If these regulations pass, then the only avenue to get approval for serious health conditions will be the new drug approval process. And that would include mandating that there must be double-blind clinical trials. Natural products do not have intellectual property rights. It is unrealistic to expect any to get through this process to get approval to treat a serious health condition. In effect, the change will institutionalize that the only drugs which will be legal to treat serious health conditions are chemical drugs with intellectual property rights. What will happen with, for example, the work of Jim Strauss and many other incredible natural health product developers? Shawn Buckley (at :55 minutes) shares how countless lives have been saved through the profound cardiovascular benefits a the 300 year old Strauss Heartdrops® herbal formula. Listen to the Strauss story. We are asking advocates of natural health products and practices to educate themselves and be prepared to take part in our upcoming action campaigns.